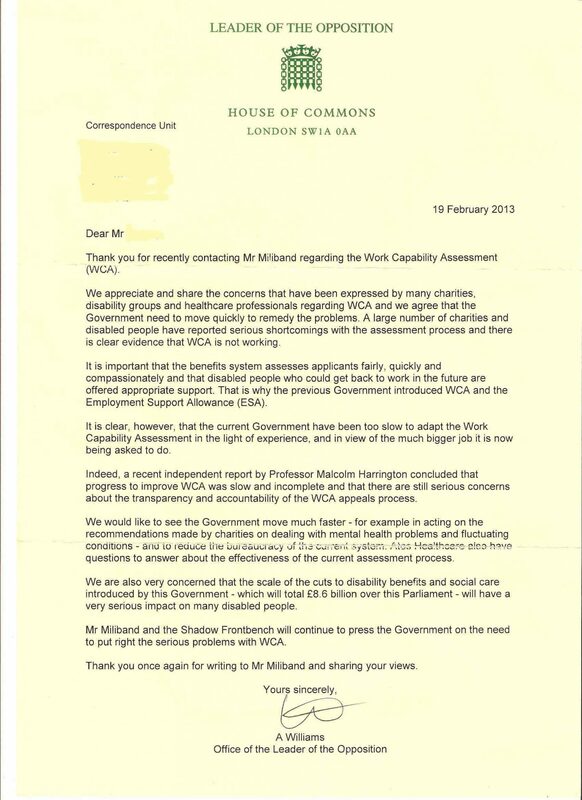 Letter from Ed Miliband on Atos/WCA but is it enough? DPAC has been passed a letter from Ed on WCA/Atos which we’ve been asked to share. While reading please remember that it was New Labour that first contracted Atos and Ed has done some visits to them too- no, not joining DPAC, or disabled people in protests outside Atos offices in direct actions against the 72 deaths a week of those being put through this inhuman regime. But as a kind of badly advised PR exercise. He seems to have stopped that now. Isn’t it over 9 billion? Cheers Ed and let us add that the work of Labour’s John McDonnell, Michael Meacher and others in bringing this Atos horror and the links between Atos and Unum in running ‘Government’ from the inside are much appreciated. Disabled and Carer Groups Joint action: "Your silence is Deafening" Labour party! The Labour party conference starts in Liverpool on Saturday. As we all know, Labour were the architects of Employment Support Allowance and the ‘not fit for purpose’ Work Capability Assessment which is so stressful and traumatic it was linked to the suicide of claimants whilst Labour were still in power. The Labour party are the official party of opposition, but they are not opposing the Welfare Reform Bill as they should be and seem to have forgotten that the 10 million sick and or disabled people plus carers, friends and family in the UK have the power to vote. It is time for us to remind Labour that they will not get any of our votes if they do not start to oppose the parts of the Welfare Reform Bill set to return sick people, disabled people and carers to a life of desperation, dependency, despair and charity. We are asking you to help with a mass email to the Labour party to remind them of our voting power. Please include the following details in your email and send it to Ed Miliband, Margaret Curran (shadow minister for disability) and Liam Byrne (shadow minister for DWP). If you have time please also email it to any Labour MP and particularly any members of the shadow cabinet. We have provided a list of email contacts below. Please aim to send your email at 11am tomorrow (Thursday the 22nd September) If you can’t send the email at 11am, don’t worry, just please try to send it at any time between then and the end of Labour party conference on Wednesday 29th September. We suggest embedding a link to this youtube video “The Sound of Silence” To embed the video into your email just copy and paste the link below. If you would like to add a short, personal message explaining to Labour how you feel about their lack of support for sick, disabled people and carers then please include it after the suggested text. You might also like to include a photo of yourself, or perhaps a photo of what disability, sickness or caring means to you. Don’t worry if you don’t want to personalise the email, sending the suggested text is fine. The millionaire wreckers now in government are determined to continue the wholesale destruction of our National Health Service and welfare state both of which most of us rely on. The National Health Service and the welfare state were fought for through generations of poverty and misery by working class people, likewise disability rights came because of the strength of those disabled people who would not accept less then their human rights. Everything worked for is being destroyed in the biggest onslaught on social justice in our life-times. DPAC believes in the united strength of disabled people to fight these savage ideological attacks. 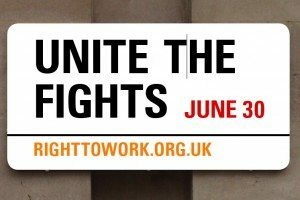 We also believe that supporting and joining in with the June 30th public sector strikes is an important part of our fight. On June 30th over 700,000 public sector workers will strike. Disabled people must be an important part of shaping the resistance to these cuts on June 30th. This strike is not just about public sector pensions, the proposed changes to public sector pensions is only a very small part of how the welfare state has already been dismantled in other countries such as US, Canada, Australia. It is vital that we join together to protect hardwon services and rights for working class and disabled people and tell the millionaire politicians who have no need of these services that they were never elected to destroy them. Added to all of that we have now witnessed the appalling ignorance and prejudice of Conservative MP for Shipley, Philip Davies, who publicly stated that disabled people should be willing to work for less then the minimum wage as employers may then be more willing to employ them. This type of outdated attitude helps to show the importance to disabled people in employment of strong unions both in the public and private sectors.